You are an organisational development professional, passionate about designing cutting-edge learning experiences. You are committed to create dynamic, inspiring learning environments that invite self-reflection and foster breakthrough growth. How good are you in igniting your learner’s curiosity for more? After your workshops, how practical does their learning feels to them? How inspired, empowered and committed do they feel to test new approaches in their work? Adults are autonomous, practical, self-directed, goal oriented learners. We seem to learn in a rather selfish manner – when WE want to, because WE want to. When WE feel it is relevant or important to us. If learning is not our own choice, it can be challenging to gain our buy-in for exploring new ideas or testing new approaches. We humans seem to nurture an amazing ability to get attached to the “right’s” and “wrong’s” of what we have come to believe to be truth about how things are in life. Even just considering the existence of any alternative perspective can be a rather peculiar challenge. It is hard for us to grasp the fact that our knowledge and paradigms do have an expiry date. Thus we need to be invited, inspired, sometimes even “tricked” into learning. Never forced or pushed. What opens up our curiosity are our own experiences. That is why designing active, participative, experiential learning processes is the key to enabling sustainable personal and team development. That is why my quest for discovering, mastering and designing new methods and tools to facilitate adult learning, never ends. 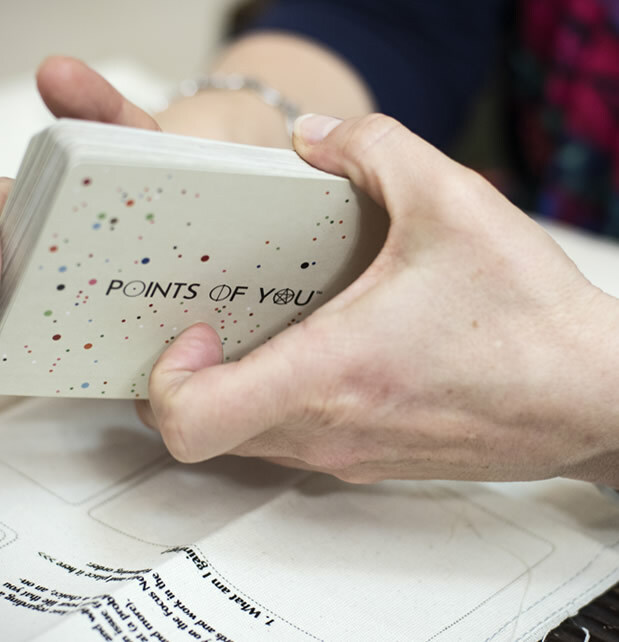 The Points of You® Train the Trainer program is an experiential workshop that will help you get acquainted with the Points of You® methodology and learn how to use and integrate Points of You® tools (The Coaching Game & Punctum) into your everyday work, fostering your success in serving your clients.